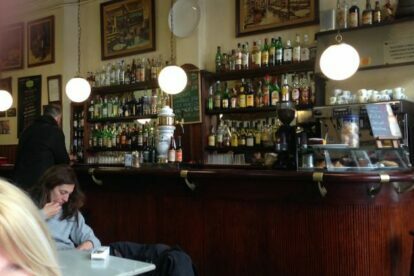 The oldest café-bar in the city. I’ve been occasionally popping into this gloriously faded antique café-bar for more than ten years – it’s changed. But it’s changed at a glacial pace. Unsurprising, given it’s been owned and managed by the same family since 1873. With its mahogany bar, marble-topped tables, fin de siècle paintings, piano, and modernista (art nouveau) flourishes, the daytime ambience is more like a tearoom than a bar, and, though they serve a selection of tapas, including morcilla (black pudding/blood sausage), tortilla and croquettas, I only ever used to have coffee and a slice of cake, or a sandwich. More recently I’ve begun exploring their very extensive beer menu, with bottled beers from Belgium; the Czech republic; England; Germany; Ireland; Scotland; Spain, and the US, as well as craft beers from local microbreweries. Most imported beers, including Brooklyn Pumpkin Ale and Scottish Brewdog, sell for between €3 and €4. But if imported and craft beers aren’t your cup of tea well, you can have a cup of tea. They serve 15 different teas. The place has been used as a setting in several movies and TV programmes. If interested in history then you may want to know that in September 1973 the 25 year old anarchist militant, Salvador Puig Antich was wounded during a shootout with Guardia Civil on the pavement just outside the bar. In March 1974, despite pleas for clemency by the Vatican and other international entities, Salvador Puig Antich became the last person to be executed by the garotte.